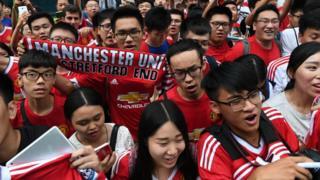 Manchester United have retained top spot as the most popular team online in China, according to a new report. Spanish giants Real Madrid are second and Germany’s Bayern Munich third. The seventh edition of the Red Card, which analyses the influence of top European clubs on China’s social media, has Arsenal fourth and Liverpool fifth. Germany’s Bundesliga remains the most influential league online, and Barcelona’s Lionel Messi is the player with the most social engagement. The Argentine accumulated more than one million new followers in China in 2017. He is ahead of Real Madrid rival Cristiano Ronaldo, who was most popular player last year. Manchester United’s Anthony Martial is the third most popular player, team-mate Paul Pogba is fourth, and ex-Old Trafford star and current Everton player Wayne Rooney is fifth. Several European teams have opened permanent offices opened in China over the past year, including Real Madrid, Bayern Munich, Borussia Dortmund, and VfL Wolfsburg. The study took its data from Chinese social media platforms WeChat and Weibo, the latter a cross between Twitter and Facebook, as well as audience figures from live streams of games and how the respective club websites and apps perform in the country. Manchester United media executive Phil Lynch said: “With over 107 million followers, China is one of Manchester United’s most important markets and we have a long history of innovation and fan engagement in the region. Near neighbours Manchester City were joint-eighth in the list of most popular clubs, and Chelsea and Tottenham Hotspur were joint tenth. ← Is Lorde criticising the Grammys?